Henry Mae Robinson Mitchell’s name should have been in Webster’s dictionary next to the word “survivor.” She was snatched from the brink of death so many times that she actually gave that word a new definition. Even in her final days at a Glenside nursing home, Henry – yes, that was her real name – was determined to overcome a stroke and live to see her 87th birthday on Aug. 6. She made it, surrounded by friends and well-wishers. Her secret was faith and guts. 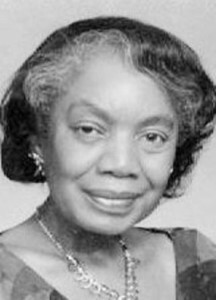 Henry Mitchell, whose fashion sense led her to employment in Philadelphia’s fashion industry, often being a pathfinder for other African-Americans, died Aug. 13. She was a longtime resident of West Oak Lane. She endured cancer, heart attacks and strokes, but she never let her health issues keep her from a full life of accomplishment and travels the world over. “She overcame cancer twice, once being given hours to live, but with an overdose of radiation, she survived, and that was over 30 years ago,” said her niece and caretaker, Joyce Mitchell. She nearly died from heart attacks and strokes two to three times in her life, many years ago. Against the advice of her doctor, she went on a cruise to the Greek islands after a hospital stay for a weak heart. She didn’t drink or smoke – but she loved to shop. Henry not only worked in the fashion industry, she was a fashionista herself, always stylishly turned out. It pained her, in fact, to see other women who lacked that fashion sense. She sometimes spoke up about it, not always endearing herself to the person who got the unsolicited advice. Henry attributed her survival to her Baptist faith. As a member of Corinthian Baptist, she worked on many programs of benefit to young people, and was a member of the Sunbeam Youth Choir and the Faithful Workers ministry. She was born in Conshohocken to Suzanne Herbert and Henry Robinson Jr. Her father, after whom she was named, died when she was an infant, and her mother moved to Pittsburgh. She later returned to Conshohocken and then to Wayne, where Henry attended Radnor High School. She was active in sports and played soccer, basketball, field hockey, polo and tennis. Meanwhile, her mother had gone to work for a Main Line family and, for a time, Henry enjoyed the privileges of high society. Recognizing Henry’s fashion and artistic sense, the family offered to send her to Paris to study. Instead, she married her childhood sweetheart, Sandy “Pat” Mitchell, in 1949. Henry worked for Quaker Lace manufacturing company, Cameo Stores, an upscale women’s fashion store, and became the first African-American sales associate for Bonwit Teller. Henry later became the first African-American telephone operator at the Acme Market corporate offices. Her mellow voice got her the job. Henry’s travels included coast-to-coast in the U.S., and trips to Hawaii, the Greek islands and other exotic destinations. Her husband died in 2004. Besides her niece, she is survived by other nieces, nephews and cousins.